Yay, we are flying!’ Matica yelled breathlessly, utterly thrilled. ‘We really made it. Yee-hah!’ Were you afraid you would chicken out? a voice asked her in her mind. She had to grin. Yes, I was but not anymore. We did it. For long minutes, with her cheek pressed to Talon’s right shoulder, her arms around his neck, she just enjoyed the impression and sensation of his feathers on her cheek. Lying on his back, she saw only his outstretched, locked-in, never ending wing of brown feathers with grey patches. Matica felt Talon nodding but wondered why he wouldn’t say anything. A few seconds later, as she looked down again, they flew over high, snow-powdered peaks of the magnificent Andes. That was fast, she wondered. We were just over the village and now we are over the Andes. Well, I guess Talon is a fast flyer. Looking down at the fast moving peaks as Talon flew over them, she felt dizzy and looked quickly ahead at the vast Andes. In the far distance, she saw a wall of dark and gloomy looking clouds with a huge rainbow stretching over the horizon. A few minutes later she looked down again. What? she wondered. How is that possible! The scenery is changing way too fast. Everything seemed flat now but colourful. There were several shades of greens and browns, greys, even yellow with specks of blues and reds. ‘How can the vast Andes vanish so quickly?’ Matica said. However, Talon wouldn’t change his course and wouldn’t say anything either. As he still wouldn’t talk, she tried to press her body deeper into Talon’s back with her arms winding around his neck, her feet clamped around the beginning of his tail, awaiting the impact of the cloud on her back. Her heart seemed to stop beating as she squeezed her eyes shut, not wanting to experience that. But after a few seconds without feeling or having the sensation of colliding, crashing or bumping that she had imagined going through the cloud, she felt moisture on her face and hands. Surprised, she opened her eyes and lifted her head. A light greyish thick and murky substance surrounded them. She narrowed her eyes because she couldn’t see anything, staring into the murky substance. She wanted to push that away with her hand but dared not let go of Talon’s neck. Gazing at the wonders of the clouds from above, she was aware that Talon was riding on the clouds, riding them out smoothly and bouncing gently from cloud to cloud. Up and down, right and left he went as the clouds were formed. Presently, directly in front of them, a dark and dirty-looking cloud puffed up high in an invisible and undetectable current. To Matica it looked like a solid mountain peak but a mountain peak that increasingly moved, twirled and twisted. In one stage it fell together, nearly disappearing, then it puffed up again, even higher than it was before. ‘Talon, don’t enter it —’ But it was too late. Talon didn’t hesitate for a second. He flew right into it. Presently Matica thought, if that cloud is forming a storm and we’re still in it, what will happen to us, to me? Nothing will happen because Talon knows what to do and will not take me into danger. She gave herself up to Talon, trusting him completely. I don’t know anything about clouds. Do I have to study clouds when I fly with Talon now? But again, do I need to know? Talon knows the cloud formations. That’s all we need. Can’t tell him what to do anyway. He is flying where he wants to go. Blinded by the smoky dark cloud that surrounded them, both were thrown around by the unpredictable current, left, right, then up and down, then left again. For a few seconds of flying level once more, still in the smoky cloud, they suddenly dropped a metre down into a wind pocket. Never thinking something like that would happen, her legs lost the grip on the beginning of Talon’s tail and they were floating a few centimetres above him. With her hands and arms clamping around his neck and trying not to give in to the gravitational pull that wanted to drag her away from Talon, Talon flapped his wings desperately to catch up with her legs, but, as gravity always has an effect, Matica’s legs fell back on his body again. Just as she wanted to clamp her feet around the beginning of his tail again, Talon’s wings were pushed down with such force that Matica’s legs were hauled off once more, even higher up this time. She flew alone in the air, above Talon, with the force pulling hard at her arms. Her poncho flew up and fluttered around her legs. 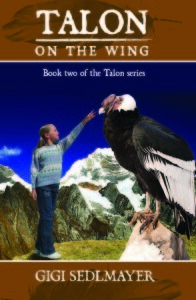 Her hands started to ache as her knuckles went white holding on at Talon’s neck. I hope I’m not strangling Talon. Would he come after me and catch me if I tumbled away? I won’t try it, won’t let it happen. But as quickly as that happened, Talon rose up again through another updraft and caught her legs on his back once more. Quickly she wrapped her legs tightly around the beginning of his tail and rejoiced that she had managed so well under those conditions, whatever they were! She also eased off her grip on Talon’s neck. But the cheer was too early. They weren’t through yet. Unexpectedly again, Talon was hauled up and to the right. Matica was first pressed into Talon’s back then, as he was hurled to the right, one of her hands lost the grip on his neck but caught a few feather tips with her fingers and thumb. Holding tight with her other hand, her fingers that had grabbed the few feathers walked slowly forward to take hold of more feathers and soon she wrapped both of her hands around his neck again. ‘Humph,’ she snorted, relieved, and thought, I nearly pulled out some of his feathers, but he didn’t complain. Why? What is with Talon? After another minute of being bashed and smashed around in that cloud, they broke through at the other end. The sun shone once more on their bodies, warming them up again as she just realised how cold it was in that strange, dark cloud, even colder than it was when they passed through the white cloud. But then a shadow passed them and shortly after Matica bumped with her back into something soft. Turning her head, she was surprised to see Tamo’s black tummy. But as suddenly as Tamo was there, so quickly he was gone again. But then, all of a sudden, she heard a very strange, odd noise, similar to a mechanical drone, resembling a motor’s deep humming. Could it be? She frowned, didn’t want to look at the noise, didn’t want to believe what she thought it was. But after all she listened carefully and knitted her brows. It really sounds like a motor, she thought. Yes, it is what I thought it is. And no, I don’t want to see it. But movement to her left and her own curiosity caused her to spin around. The overwhelming shock of seeing the thing she had thought about caused her to stop breathing. She was looking at the white and shiny underbelly of an airplane! She jerked and trembled uncontrollably in real shock and could only think that they were that high up. She tried to squeeze her legs firmly around the beginning of his tail for not losing the grip on him, simultaneously she tightened the grip around his neck. But her legs enclosed emptiness. So did her hands. There was no Talon anymore. Talon was gone and she fell, faster and faster into the unknown black space under her.